There are times when the mostly rightly-acclaimed Spider-Man: Into the Spider-Verse is a bit much — mainly towards the end, because the movie is also a bit long. I can’t get mad at it, though. Its too-muchness is almost all creative; it has an abundance of ideas, invention, color, visual and verbal wit. It’s an overflowing package — I would say “generous,” except that at a certain level of corporate involvement, the word has a whiff of panem et circenses. Due to cross-marketing synergy, the soundtrack is spangled with recording artists from the 2010s; future generations of movie-lovers, if any, may smirk at the film and tweet “OMG #so2010s,” the way ‘90s movies are now pegged immediately by the presence of the Wallflowers or No Doubt. Until its shoulder touch becomes a little grating, Spider-Verse is good raucous fun — fluid and fast, though swollen with incident. If nothing else, it’s a wet finger held up to the winds of where animation is now, technically. The movie keeps up a constant visual whiz-bang that would have been unimaginable, and maybe neurologically unreadable, twenty years ago. (And 1999, you’ll remember, gave us the visual game-changer The Matrix.) The animation here is used for its nearly endless potential to deliver images, sequences, transitions impossible in live action. Some of it continues techniques the Fleischer brothers were using a hundred years ago; some of it pushes the lateral editing of Natural Born Killers forward a few steps. Spider-Verse is the present and future of its medium, and it was rightly awarded at the Oscars accordingly. The technical flourishes help to sell the story, which really couldn’t be told as easily in live action. We’re in Manhattan, or Sony/Marvel’s Manhattan, where Spider-Man exists but Iron Man and the X-Men don’t. (Don’t ask.) Peter Parker (voice by Chris Pine) wears the spider-suit, swinging around and fighting crime. He’s been at it for about ten years — he’s 26 now. Fortunately, teenager Miles Morales (Shameik Moore) gets bitten by a radioactive spider himself, and gains many of Peter’s same powers plus a couple all his own — he can turn invisible and zap his enemies with electricity, though he can’t yet control those things. Spider-Man’s adversary the Kingpin (Liev Schreiber) wants to open a portal to other dimensions, and his experiments, led by Olivia Octavius (Kathryn Hahn), pull a bunch of alternate-universe Spideys into Miles and Peter’s realm — Spider-Gwen, Spider-Man Noir, Peni Parker, an older Peter Parker, and, last but not least, Spider-Ham. The nice thing about Spider-Verse is that a viewer young or old can come to it pretty clean of prior experience with Spider-Man. All the alternate Spideys are from the comic books, but you don’t need to have read any of them — I haven’t — to enjoy the characters here. Each Spider-Variant’s origin story is recounted in quick, nimble shorthand, and you get a sense of each one’s personality and demons — they’ve all suffered bereavement of some sort. Even the Kingpin, rendered as a white monolith inspired by artist Bill Sienkiewicz’s expressionist take, has a motive grounded in grief: his blameless wife Vanessa and son witnessed him beating up Spider-Man, fled, and died in a car accident. The Kingpin therefore wants to access universes in which his wife and son are still alive. Another villain, Prowler, turns out to be more sympathetic than we first assume. Marvel’s super-foe roster is generally full of bad guys/girls who aren’t evil for the hell of it — they have tragic flaws. All the Spider-People join forces to defeat Kingpin and his minions, and in the resulting whirligig of action some of their individuality gets lost. It’s ultimately Miles’ story — I suppose we need to thank the superhero genre for creating a context for a young hero of African-American and Puerto Rican extraction. (Without the superpowers Miles would probably be the protagonist of an indie flick you’d have to drive into the big city to see.) Spider-Verse is inclusive and welcoming of diversity; its wildly divergent heroes get along, united by their similarities of origin and skill set. It is everything a specific, noxious breed of sexist, racist, humorless alt-right fanboy despises, and its success should be celebrated on that level. As for me, I’m glad I saw it, I might revisit it in the proper mood, and I admire it as a glistening piece of pop art. But its corporate pizzazz chills me a little. A good way to milk a franchise for even more sequels and crossovers and merchandise than would normally be possible is to introduce alternate universes into it. Suddenly you have much more licensable content, and if an actor wants more money for a sequel, you just bring in an alternate version of the character for a less pricey actor. With great power must come great responsibility to the shareholders. Netflix’s The Christmas Chronicles lasts, with credits, one hour and forty-four minutes, of which fifty-three minutes are worthwhile. You’re way ahead of me: those are the minutes featuring Kurt Russell as Santa Claus (he prefers “Saint Nick”), a robust, not quite jolly old elf who oddly seems to fit right in with Russell’s recent run of hirsute cowboys and rough workers with a surplus of chin and/or lip fur. (Not to mention the global twinning of Russell now having played bearded heroes of the North and South Poles.) Russell plays Santa with absolute integrity, which in this context means he plays Santa as Kurt Russell playing Santa, which is the only reason most people of legal age would want to watch this. And he delivers. Sadly, Russell shares the movie with two irritating kids, chipper believer Kate (Darby Camp) and her sullen teenage older brother Teddy (Judah Lewis). They’re bummed because their firefighter dad died on duty, this is their first Christmas without him, and their mom (Kimberly Williams-Paisley in an utterly thankless role) just wants them to get along. Because Teddy no longer has a father figure, he’s drifting towards crime (he and his buddies literally steal a car for a joyride at one point). Teddy needs to be bitter and cynical so that, of course, he can relearn Christmas Spirit over the course of the movie, but that could have been accomplished without all the grand-theft-auto stuff that can’t help implying that single women can’t raise boys without disaster. On Christmas Eve, these kids, led by Kate, find themselves in Santa’s sleigh, where they startle him and he lands them somewhere in Chicago without his reindeer or his magic hat. If he doesn’t get these items back soon, there will be no Christmas cheer, by which the movie means no presents. I kept waiting for the film to break out the old platitude that Christmas is about more than presents, but nope. It’s about presents and also about the other dude of the day — at one quiet moment in the adventure, Kate and Teddy pause outside a church and sadly reflect that they haven’t been since their dad died. Which, I guess, means their mother hasn’t brought them? So we’ll blame her for her kids being godless, too! It’s probably useless to come at The Christmas Chronicles with politics, though there is that odd moment where Santa, denying that he actually says “Ho ho ho,” grumps “It’s just a myth. Fake news.” That’ll date the movie in a bad way, not that Netflix cares, nor its uninspired director Clay Kaytis (an animation guy who graduated to jodhpurs and megaphone with the Angry Birds movie). A good deal of the film is an excuse for elaborate CG effects, which have no magic; even a long look inside Santa’s toy bag is a multilevelled vision of card catalogs and conveyor belts of gifts — it’s like Terry Gilliam without a brain. At least Sofia Coppola’s A Very Murray Christmas had some soul (and Bill Murray). Russell tries his damnedest, though. In a sequence that will justify the movie for some, Santa jams in a prison cell with some surprise ringers whose identities I won’t spoil (a hint: if the movie had any wit it would’ve stranded Santa in Jersey). Russell himself takes the lead on “Santa Claus Is Back in Town,” and he’s in good voice, busting out his old E moves (Elvis, of course, first recorded the song sixty-one autumns ago). Now, having Kurt Russell get his Elvis on, as well as winking at some of his past roles (“Big trouble,” Santa intones), will tickle some of the audience, including yr. humble scribe. And I can’t feel sad for Russell being in a movie that’s unworthy of him in general, because he lifts all his scenes so effortlessly, bringing his own cool party with him and inviting us to join in. I also liked the way Russell plays the many scenes in which Santa knows various folks’ childhood dreams and hopes. His Santa is a little irascible, given the circumstances, but also good-hearted. This isn’t one of Russell’s challenging performances, like those in the underrated Miracle or Dark Blue. Here, he reminded me of Jeff Goldblum, who can also get artsy and serious, but whose natural charisma is such that you can be content just watching Jeff having fun being Jeff. And the same is true of Kurt. For fifty-three minutes. Does everything need to be a movie? Even the staunchest film buff might wonder from time to time. Some material — a book, a comic, a Broadway show, a concept album — is perfectly content to stay what it is and not get amped up and dumbed down to placate the multiplexers. The enduringly popular The Prophet, a book of spiritual prose poetry by the Lebanese-American writer Kahlil Gibran, might seem to be that kind of material. Like the Ancient Mariner, its titular protagonist stops and talks to random listeners; unlike the Mariner, the Prophet, Al-Mustafa, relates no compelling narrative, but a series of ruminations on life, death, love, work, and so on. Movies were made out of such comparable ’60s dorm-room faves as Jonathan Livingston Seagull and The Little Prince, but Gibran’s work has for almost a century seemed happy enough to exist as a pocket-size book. Now there is an animated film “inspired by” The Prophet, and its driving force is co-producer Salma Hayek, who has Lebanese roots on her father’s side. The film is a personal project for Hayek, who also voices a character in the movie, a character that, like most others onscreen, does not actually figure in Gibran’s book. No matter. Hayek has clearly undertaken this project because she wants it to reach children in some way, even in somewhat watered-down and very abbreviated form (the script often just paraphrases Gibran, and only eight of the book’s 26 poems are tackled). And even the least generous viewer might have to admit, it could have been a lot worse. One shudders at the thought of a Disneyfied Al-Mustafa (shortened here to Mustafa) belting show tunes (“Your Children Are Not Your Children,” performed by Adam Levine ft. Lorde). We sort of get a Disney version anyway, because writer-director Roger Allers, who helmed The Lion King, devises a framing sequence that seems a bit Aladdin-y, complete with young heroine Almitra running all around a street bazaar in a typical boisterous Disney opener to hook the kids. Once the movie settles down, it improves. Almitra, who hasn’t spoken since her father died, accompanies her mother Kamila (Hayek) to a remote spot where the poet Mustafa (Liam Neeson) is under house arrest for seditious poetry. Kamila goes there every day to clean house, but then Mustafa is mysteriously set free, and on his way to the ship that will carry him home he meets various people whom he favors with his insights on life, death, love, work, and so on. It’s here that The Prophet becomes a sampler of work from animators the world over, from Nina Paley (Sita Sings the Blues) to Bill Plympton (The Tune) to Joann Sfar (The Rabbi’s Cat) to Tomm Moore (The Secret of Kells). A lot of this stuff is elegant, imaginative, first-rate (although my issue with Plympton as a guy who does animation to show off how clever he is — a sort of Alejandro Gonzalez Iñarritu of cartoons — persists here). The visualizations of Gibran’s concepts are sometimes so arresting that I, for one, lost track of what narrator Neeson was saying — not an effect Gibran would have wanted. Viewed as part of the continuum of animation history, a work whose ancestors include Fantasia and, structurally, Heavy Metal (in which a girl is told stories by a glowing green ball), The Prophet works much better. The “in” to the more abstract and experimental sections is the bland Allers-designed frame, with such uninspired touches as Mustafa’s affable guard Halim (John Krasinski) harboring a crush on Kamila. I know it’s there to ease Disney/Pixar-reared kids into the good stuff, but every time an interlude finished and we trudged back into dull Allers territory, I could feel myself deflate and my attention slacken. 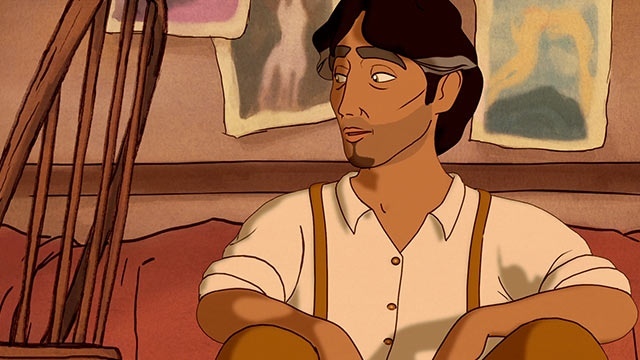 The ideal presentation of Gibran’s work is still to be found on bookshelves worldwide (or perhaps in the 1974 album, read by Richard Harris), but as a calling card for eight indie animators, it gets the job done. In Disney’s latest feature Frozen, the true love that saves the day turns out not to be between the prince and the princess but between sisters. This deserves some applause. It also doesn’t end with everyone married off — Elsa the Snow Queen (Idina Menzel) will apparently govern the land of Arendelle without a king. Not that she needs a king, or anyone else, to protect her; Elsa has extreme, almost apocalyptic powers over ice and snow, and in Disney’s more simplistic days she would’ve been the villain of the piece. Instead, fearing that she’ll hurt people — a fear instilled in her when she accidentally almost killed her younger sister Anna — Elsa goes into self-imposed exile, where she creates her own magic queendom of ice and sings heartily that she can finally be herself. Meanwhile, though, Arendelle suffers through year-round winter. What makes Frozen interesting is the way it humanizes the standard Disney villain so that she isn’t a villain at all, but also weighs the consequences her powers have. Elsa pushes people away for their own good, but her dramatic exit from her land leaves it barren. She keeps her door locked against Anna, who grows up not knowing why. The movie spends a great deal of time on Anna (Kristen Bell) trying to reach Elsa; it’s as if Anna were the standard Disney hero trying to rescue the princess, except that she’s trying to rescue Elsa from herself. Anna represents unconditional love (she wants to jump into marriage with a guy she’s just met); Elsa represents fear, which is, I think, what the movie’s showstopping tune “Let It Go” really refers to. The emotional throughline is all about trying to bring Elsa back into the mainstream of society, a society that’s quick to reject her as a “monster” when she first “comes out” as magically gifted. To see it through a nerdish superhero prism, Professor X of the X-Men would try to help Elsa harness her powers for the greater good, while Magneto would encourage her to stay in her ice castle, perhaps build many brothers to the hulking snow beast she makes to scare Anna away, and crush the human peons. Essentially, Elsa is a mutant, and is handled with post-X-Men compassion, but Anna the normal is the real focus and hero. Anna’s big number is “For the First Time in Forever,” which details her longing for contact with her sister and with people in general. Elsa is offscreen a lot, but the movie fixates on her normalization — though, like I said, unlike Anna (who pairs off with a hunky ice merchant who helps her), but like many evil Disney queens, Elsa has no male companion. Given her similarity to the mutants of X-Men, and given that the earlier X-Men films equated mutants with gay people, is Elsa Disney’s first gay (and pro-gay) character? Beyond all this, Frozen is a beautifully crafted fable, with snowscapes and ice convincing enough to make a viewer shiver (maybe they should’ve released this in July). The songs are by and large forgettable, though that could just be me — the only Disney song in the last 25 years of which I have any memory is “Under the Sea.” Kristen Bell brings charming awkwardness to Anna (the movie may set a record for the number of uses of “Wait, what?”), and Idina Menzel, familiar with playing misunderstood sorceresses after her Tony-winning turn as Wicked’s Elphaba on Broadway, infuses Elsa with gravitas and regret. Elsa definitely knows that with great power comes great responsibility, but instead of outing herself and doing some good, she chooses to hide. That’s the other thing about Frozen — choice. The women have agency. Elsa makes mostly bad choices, Anna makes mostly good choices (other than her initial taste in men), but they each own them and exist with them. And instead of demonizing Elsa for her choices, the movie shows endless concern for her well-being. I can’t say it’s a coincidence, then, that Frozen was written and co-directed by a woman (Jennifer Lee) — this is, in fact, the first animated feature under the Disney banner with a woman so credited. Lee (whose partner was Wreck It Ralph’s Chris Buck, who handled the animation side of things) has made a casually feminist, no-big-deal entertainment — it certainly passes the Bechdel test — in which a man can assist in saving the day, but it’s really up to the sisters. Only female hearts in unison can melt the ice that entraps a kingdom. The lesson is administered with no small amount of humor (thankfully no fart humor, though we do get a booger joke) and good nature; the heavy moments aren’t lingered on, and the narrative is a fast straight arrow aimed at the simple goal of reuniting two sisters who used to love to build snowmen together. The 1984 Frankenweenie wasn’t a failure, though; it was a charming tribute to the monster movies Burton grew up on (and this was before his career grew a little too long on charming tributes to the monster movies he grew up on). The new one — call it Frankenweenie 2.0 — pretty much tells the whole story of the earlier version, with some padding that gets a little tiresome but does produce more monsters. Young Victor Frankenstein (voice of Charlie Tahan) obsesses over monster movies to the point of making his own, starring his beloved dog Sparky. One day, Sparky chases the wrong ball at the wrong time, and Victor loses his movie star and best friend. But not for long: Inspired by his science teacher (Martin Landau), Victor brings Sparky back to life on a dark and stormy night. There are a couple of sad moments for dog lovers, especially those who have dug their share of tiny graves. But overall this is a comedy; Sparky doesn’t come back as a monster — he comes back as the same Sparky, except that his tail or his ear occasionally falls off (“I can fix that” is Victor’s refrain), and he needs to be “topped up” with a jolt of electricity every so often. I have to say I prefer the original version, not only because it felt fresher at the start of Burton’s career, but because it was shorter and didn’t succumb to subplots. Here, we get complications when other kids in Victor’s class find out about Sparky, and they want to learn Victor’s secret so they can win the school’s science fair. We don’t really care if they succeed or fail; it’s just a distraction from what should be the main event, in which the townspeople, horrified, corner Sparky at a windmill, just like old times. The windmill in the original short was a small windmill at a mini-golf course. Here it’s a real windmill, and Victor has to run up endless stairs to save his neighbor Elsa (Winona Ryder) from a hybrid cat/bat as the windmill burns down around them. It reminded me of the entirely unnecessary fight at the end of Burton’s Edward Scissorhands, which felt as if Burton had internalized all the studio notes he got on Batman. You gotta have a bang-up finish, kiddo! But the tiny windmill in the original had so much more charm; you knew Burton didn’t have the budget to build and burn down a big windmill, so he improvised. In stop motion, you can do anything (and let’s have a round of applause for Trey Thomas, the animation director here), and some of the additions are inspired — I enjoyed the re-animated turtle who becomes a sort of non-flying Gamera — but some of it nudges our ribs a little too hard. Hey, remember Gremlins? How about Jurassic Park? I suppose we should be thankful there isn’t a dancing number (no numbers at all, actually, except for some simpy end-credits song sung by Karen O). 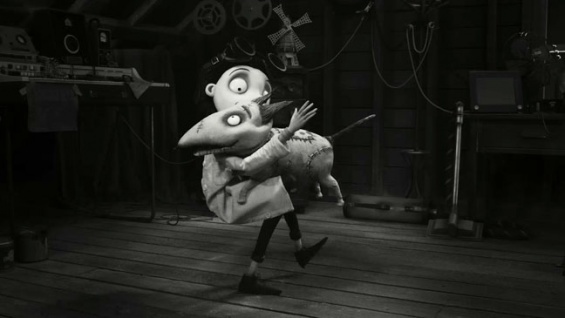 As long as it stays with the friendship of Victor and Sparky, Frankenweenie is fine. The look and tone are — say it with me now — a Charming Tribute to the Monster Movies Tim Burton Grew Up On, same as Nightmare Before Christmas and Corpse Bride and Sleepy Hollow and many others. The thing is, Disney should’ve had more faith in this premise back in 1984, when it mattered, instead of shocking it back to a bigger life now, after we’ve seen Burton return to this cobwebbed well again and again and again. It’s been said before, but Burton is almost ready for his own amusement park — Burtonworld, home of dozens of lovable misfits, land of sportively macabre imagery. Frankenweenie passes 87 minutes nicely, but apparently the 54-year-old Burton doesn’t have much more to say with this story than the 26-year-old Burton did. That’s a little dispiriting. Moreso even than Where the Wild Things Are, Wes Anderson’s stop-motion whimsy Fantastic Mr. Fox plays like an art film more for adults than for kids (not to say that kids won’t also enjoy it). We may be watching talking foxes and badgers, but they have very grown-up issues. 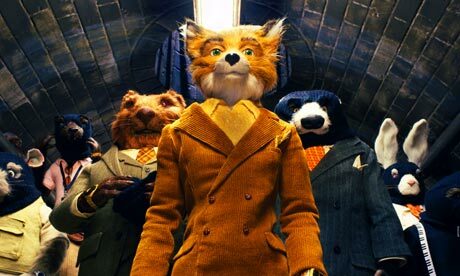 Mr. Fox (raffishly voiced by George Clooney) used to steal chickens for a living; he was a pro at it, and he loved it. But after his wife (Meryl Streep) became pregnant, he swore to go legit as a newspaper columnist. Fox’s disreputable past, though, keeps calling to him, and soon enough he lapses back into a life of crime, to the chagrin of three local farmers who’ll stop at nothing to kill Fox and his associates. The throughline is simple: Fox wants food and safety for himself and his community — as simple as a Bugs Bunny short, really. So we’re pulled right in, and as the saying goes, fairly soon we forget we’re watching stop-motion, even though the technique calls attention to itself. The ads are calling Fox “groundbreaking,” though I think what that means is that Anderson — rather than relying on slick CGI like everyone else — has chosen a consciously old-school style, one that doesn’t cheat or hide the manipulation; the animals are designed with real fur, usually a no-no in stop-motion because you can’t control its movement from frame to frame. So there is some wildness here after all. The style, like the theme, is poised gracefully between order and chaos. The TV commercials, of course, emphasize the goofy kid-pleasing moments, but most of Fox is gratifyingly mellow. The voice actors, including Anderson mainstays Bill Murray, Owen Wilson and Jason Schwartzman, speak to each other as if they were in a quirky adult comedy; nobody falsely projects, sweatily calling out to the back row of inattentive children. The color scheme is radiantly autumnal, not the usual banging-together of discordant hues that kiddie-flick animators think will hook the eye. The compositions are classic Anderson, painstakingly symmetrical. The soundtrack is Anderson’s typical callback to ‘60s tunes, including the Beach Boys (used surprisingly unobtrusively) and, at one point of tension, the Rolling Stones’ “Street Fighting Man.” That song, the last one the Stones played at the fateful Altamont concert, kicked up a bit of fuss in its day for its lyrics espousing revolution, and now it graces a children’s film produced by 20th Century-Fox. I can see the angry letter-writing campaign and boycotts from here. Though, again, it isn’t really a children’s film — but tell that to Glenn Beck and his acolytes. This is how we’re introduced to Max (Max Records), the little-boy hero of Where the Wild Things Are: he’s rampaging through his house, “hunting” the family dog — growling at it, finally tackling it. Max’s “hunt” reminded me of when my pomeranian does much the same thing to my cats. She isn’t trying to kill or even hurt the cats — it’s just play. So, too, with Max, who feels wildness in his soul, inchoate feelings of abandonment and rage he can only deal with by devolving. His mom is divorced and busy, his dad is never around, his older sister is growing away from him. There’s nothing much Max can do but growl and howl. Hunter S. Thompson prefaced Fear and Loathing in Las Vegas with Samuel Johnson’s line “He who makes a beast out of himself gets rid of the pain of being a man.” Johnson’s line could as well have led into Maurice Sendak’s classic children’s book, which has entranced kids and scandalized certain adults for generations. Spike Jonze’s film version may reverse the equation: adults may get more out of it than kids will, and indeed Jonze has spoken of it as more a film about childhood than a film for children. In the book, Max is sent to bed without supper, and imagines that his bedroom turns into a vast shaggy forest inhabited by “wild things” — massive creatures who at first want to eat him, until he convinces them to worship him as a king. In the movie, Max sees his mother (Catherine Keener) on the couch with her boyfriend (Mark Ruffalo) and loses it — he “acts out,” biting his mom on the shoulder and taking off into the night, eventually finding a boat and floating off to the island of the wild things. 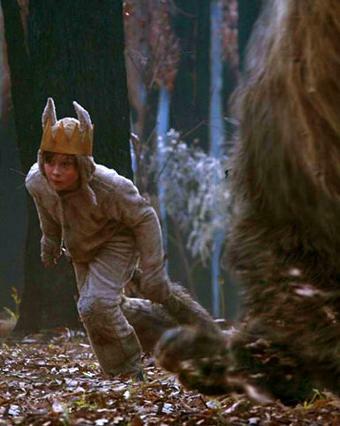 Where the Wild Things Are was shot (beautifully, by cinematographer Lance Acord) in various parts of Australia, and the locale makes about as much sense as a boy’s fecund, capricious fantasy of the perfect place — it has a forest, a desert, and a sea. The forest is usually dark, though when Max and the wild things run out to the cliffs, it’s perfect orange dusk. This is an anomaly, an idiosyncratic art film with a big budget, psychologically dense yet emotionally transparent. Max’s pain is reflected by the wild things, a morose and grumbling pack, including the big destroyer Carol (voiced by James Gandolfini), who may stand in for Max’s Id. Essentially, the movie is about Max’s journey from childish solipsism (“Woman, feed me!” he bellows at his mom on her date night) to an awareness of situations and feelings outside himself. Max’s new responsibilities as the “king” of the wild things — he has promised to banish sadness from their land — bring him to a greater understanding of what his mom deals with. The bickering couple Ira (Forest Whitaker) and Judith (Catherine O’Hara) may represent Max’s divorced parents, while the distant but warm KW (Lauren Ambrose) may be both a big-sister and mother figure. The narrative is free-form enough to be interpreted any number of ways, none of which will be right or wrong. This is a strange (and moving) heffalump indeed, a future cult classic if ever there was one, and to believe in it you have to believe in the unfocused anger of a nine-year-old who doesn’t understand much of anything until others look to him for guidance. He learns, as it were, on the job, and he is imperfect. The movie, on the other hand, strikes me as perfect on every level. Some will find it amorphous and even boring — it’s not the usual CGI razzle-dazzle we’ve been led to expect from movies based on children’s literature, with the latest hot comedian playing to the rafters through pounds of latex. At its best, it communicates the pain of being a boy who gets rid of that pain by making a beast out of himself, before learning to put childish — and wild — things behind him.